O God, who didst add blessed Matthias to the number of thy Apostles: grant, we beseech thee, that, by his prayers, we may be always sensible of the effects of thy mercy. Through our Lord Jesus Christ, thy Son, who liveth and reigneth with thee, in the unity of the Holy Ghost, God, world without end. Amen. An Apostle of Jesus Christ, St. Matthias, is one of the Blessed choir, which the Church would have us honour during [this] Season... Matthias was one of the first to follow our Saviour, and he was an eye-witness of all his divine actions up to the very day of the Ascension. He was one of the seventy-two Disciples; but our Lord had not conferred upon him the dignity of an Apostle. And yet, he was to have this great glory, for it was of him that David spoke, when he prophesied that another should take the Bishopric (Ps, cviii. 8; Acts, i. 16) left vacant by the apostacy of Judas the Traitor. In the interval between Jesus’ Ascension and the Descent of the Holy Ghost, the Apostolic College had to complete the mystic number fixed by our Lord himself, so that there might be “The Twelve” on that solemn day, when the Church, filled with the Holy Ghost, was to manifest herself to the Synagogue. The lot fell on Matthias (Acts, i); he shared with his Brother-Apostles in the Jerusalem persecution, and, when the time came for the Ambassadors of Christ to separate, he set out for the countries allotted to him. Tradition tells us, that these were Cappadocia and the provinces bordering on the Caspian Sea. The virtues, labours and sufferings of St. Matthias have not been handed down to us: this explains there being no proper Lessons on his Life, as there are for the Feasts of the rest of the Apostles. Clement of Alexandria records, in his Writings, several sayings of our holy Apostle. One of these is so very appropriate to the spirit of the present Season, that we consider it a duty to quote it. “It behoves us to combat the flesh, and make use of it, without pampering it by unlawful gratifications. As to the soul, we must develop her power by Faith and Knowledge.” How profound is the teaching contained in these few words! Sin has deranged the order which the Creator had established. It gave the outward man such a tendency to grovel in things which degrade him, that the only means left us for the restoration of the Likeness and Image of God unto which we were created, is the forcibly subjecting the Body to the Spirit. But the Spirit itself, that is, the Soul, was also impaired by Original Sin, and her inclinations were made prone to evil:—what is to be her protection? Faith and Knowledge. Faith humbles her, and then exalts and rewards her; and the reward is Knowledge. Here we have a summary of what the Church teaches us during the two Seasons of Septuagesima and Lent. Let us thank the holy Apostle, in this his Feast, for leaving us such a lesson of spiritual wisdom and fortitude. The same traditions, which give us some slight information regarding the holy life of St. Matthias, tell us that his Apostolic labours were crowned with the palm of martyrdom. The Appointment of St. Matthias. St. Clement of Alexandria assures us, from tradition, that this saint was one of the seventy-two disciples, which is confirmed by Eusebius and St. Jerom; and we learn from the Acts of the apostles, that he was a constant attendant on our Lord, from the time of his baptism by St. John to his ascension. St. Peter having, in a general assembly of the faithful held soon after, declared from holy scripture, the necessity of choosing a twelfth apostle, in the room of Judas; two were unanimously pitched upon by the assembly, as most worthy of the dignity, Joseph, called Barsabas, and, on account of his extraordinary piety, surnamed the Just, and Matthias. After devout prayer to God, that he would direct them in their choice, they proceeded in it by way of lot, which falling by the divine direction on Matthias, he was accordingly associated with the eleven, and ranked among the apostles. When in deliberations each side appears equally good, or each candidate of equally approved merit, lots may be sometimes lawfully used; otherwise, to commit a thing of importance to such a chance, or to expect a miraculous direction of divine providence in it, would be a criminal superstition and a tempting of God, except he himself, by an evident revelation or inspiration, should appoint such a means for the manifestation of his will, promising his supernatural interposition in it, which was the case on this extraordinary occasion. The miraculous dreams or lots, which we read of in the prophets, must no ways authorize any rash superstitious use of such means in others who have not the like authority. We justly admire the virtue of this holy assembly of saints. Here were no solicitations or intrigues. No one presented himself to the dignity. Ambition can find no place in a virtuous or humble heart. He who seeks a dignity either knows himself unqualified, and is on this account guilty of the most flagrant injustice with regard to the public, by desiring a charge to which he is no ways equal: or he thinks himself qualified for it, and this self-conceit and confidence in his own abilities renders him the most unworthy of all others. Such a disposition deprives a soul of the divine assistance, without which we can do nothing; for God withdraws his grace and refuses his blessing where self-sufficiency and pride have found any footing. It is something of a secret confidence in ourselves, and a presumption that we deserve the divine succor, which banishes him from us. This is true even in temporal undertakings; but much more so in the charge of souls, in which all success is more particularly the special work of the Holy Ghost, not the fruit of human industry. These two holy candidates [Joseph, called Barsabas, surnamed the Just, and Matthias] were most worthy of the apostleship, because perfectly humble, and because they looked upon that dignity with trembling, though they considered its labors, dangers, and persecutions with holy joy, and with a burning zeal for the glory of God. No regard was had to worldly talents, none to flesh and blood. God was consulted by prayer, because no one is to be assumed to his ministry who is not called by him, and who does not enter it by the door (St. John, x. 1), and with the undoubted marks of his vocation. Judas's misfortune filled St. Matthias with the greater humility and fervor, lest he also should fall. We Gentiles are called upon the disinherison of the Jews, and are ingrafted on their stock (Rom, xi. 11, 12). We ought therefore to learn to stand always in watchfulness and fear, or we shall be also cut off ourselves, to give place to others whom God will call in our room, and even compel to enter, rather than spare us. The number of his elect depends not on us. His infinite mercy has invited us without any merit on our side; but if we are ungrateful, he can complete his heavenly city without us, and will certainly make our reprobation the most dreadful example of his justice, to all eternity. The greater the excess of his goodness and clemency has been towards us, the more dreadful will be the effects of his vengeance. Many shall come from the east and the west, and shall sit down with Abraham, Isaac, and Jacob in the kingdom of God; but the sons of the kingdom shall be cast forth (St. Matth, viii. 11, 12). 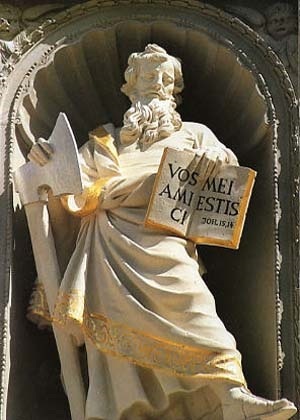 St. Matthias received the Holy Ghost with the rest soon after his election; and after the dispersion of the disciples, applied himself with zeal to the functions of his apostleship, in converting nations to the faith. He is recorded by St. Clement of Alexandria, to have been remarkable for inculcating the necessity of the mortification of the flesh with regard to all its sensual and irregular desires, an important lesson he had received from Christ, and which he practised assiduously on his own flesh. The tradition of the Greeks in their menologies tells us that St. Matthias planted the faith about Cappadocia and on the coasts of the Caspian sea, residing chiefly near the port Issus. He must have undergone great hardships and labors amidst so savage a people. The same authors add that he received the crown of martyrdom in Colchis, which they call Ӕthiopia. The Latins keep his festival on the 24th of February. Some portions of his relics are shown in the abbatical church of Triers, and in that of St. Mary Major in Rome, unless these latter belong to another Matthias, who was one of the first bishops of Jerusalem: on which see the Bollandists. As the call of St. Matthias, so is ours purely the work of God, and his most gratuitous favor and mercy. What thanks, what fidelity and love do we not owe him for this inestimable grace! When he decreed to call us to his holy faith, cleanse us from sin, and make us members of his spiritual kingdom, and heirs of his glory, he saw nothing in us which could determine him to such a predilection. We were infected with sin, and could have no title to the least favor, when God said to us, I have loved Jacob: when he distinguished us from so many millions who perish in the blindness of infidelity and sin, drew us out of the mass of perdition, and bestowed on us the grace of his adoption, and all the high privileges that are annexed to this dignity. In what transports of love and gratitude ought we not, without intermission, to adore his infinite goodness to us, and beg that we may be always strengthened by his grace to advance continually in humility and his holy love, lest, by slackening our pace in his service, we fall from this state of happiness, forfeit this sublime grace, and perish with Judas. Happy would the church be, if all converts were careful to maintain themselves in the same fervor in which they returned to God. But by a neglect to watch over themselves, and to shun dangers, and by falling into sloth, they often relapse into a condition much worse than the former.